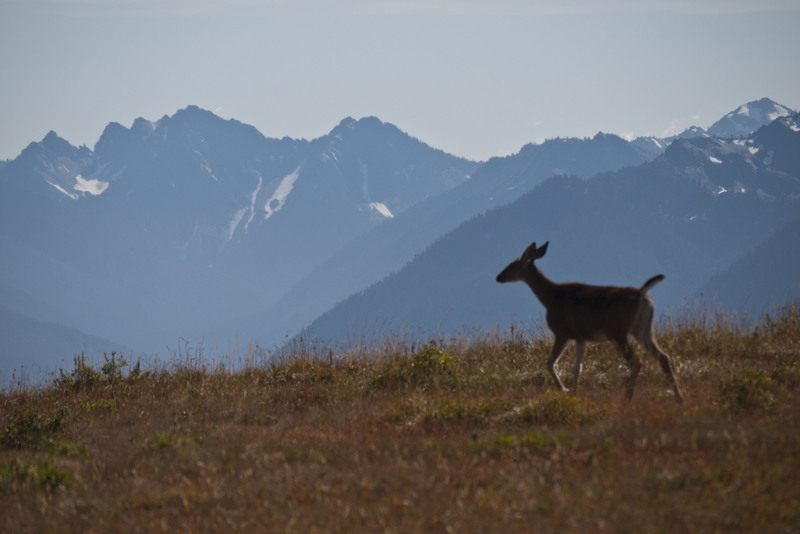 The centre of the Olympic peninsula is pretty much uninhabited and is given over to the Olympic National Park. This is pretty mountainous terrain and the lowlands are dominated by rainforest. This is where the Twilight films are set and the forests are thick, wet and abundant. For our first day in the Park we headed to the Sol Duc area (sounds exotic but the road there is really called the Sole Duck Rd). 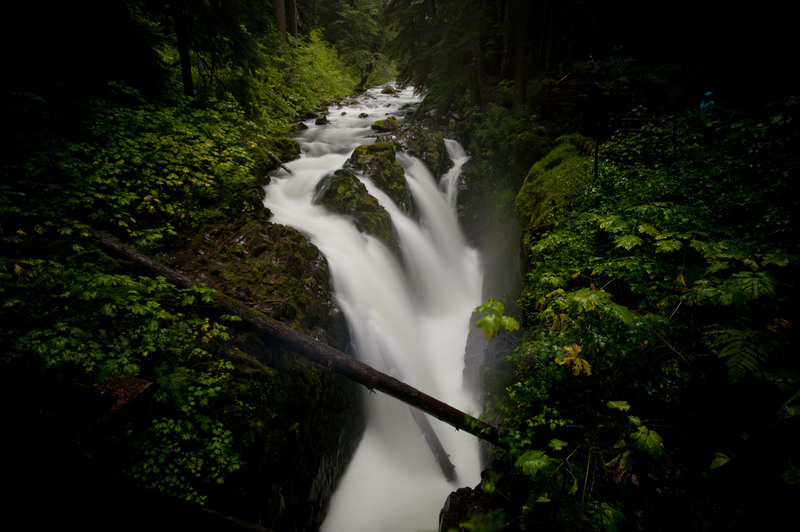 At Sol Duc is a lovely resort built on a hot spring which meant that we had to try out the water. They had three pools varying in temperature from 100F to 106F and a swimming pool that was only 70F. 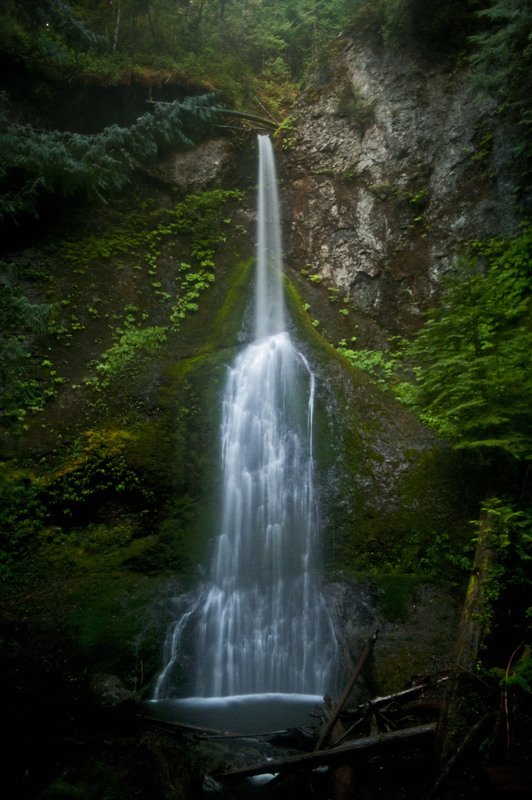 After this we drove to a trail head to the Sol Duc falls which was a walk through rainforest to a bridge over the gorge just down from the falls. It started raining soon after we started and stopped just before we got back to the car. Driving away from the falls we drove past a river where we stopped to watch Salmon battling their way up a waterfall and rapids. They would often make it half way up with a massive amount of effort and then would be swept back down. 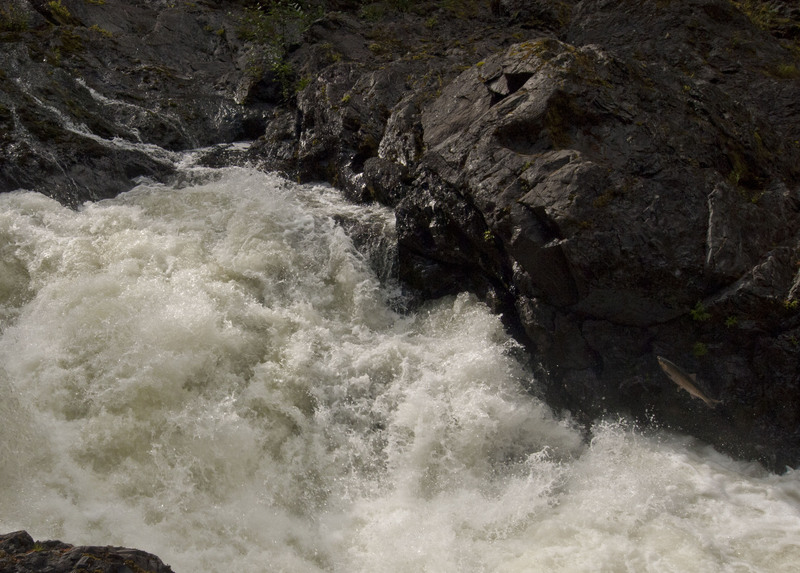 There is a salmon flying through the air in the picture below, against the rocks, if you can make it out. After that we drove out to the Storm King area and went for another short walk to Marymere falls. It started raining soon after we started and stopped just before we got back to the car. Hmm – a pattern is starting I think. From here we drove back to Heart of the Hills for the night. The next day we drove straight up Hurricane Ridge Road – 12 miles long but rising to over 1500m. Our average speed was 20mph up here. As we neared the top the vista opened up and we could see a range of snow capped mountains. 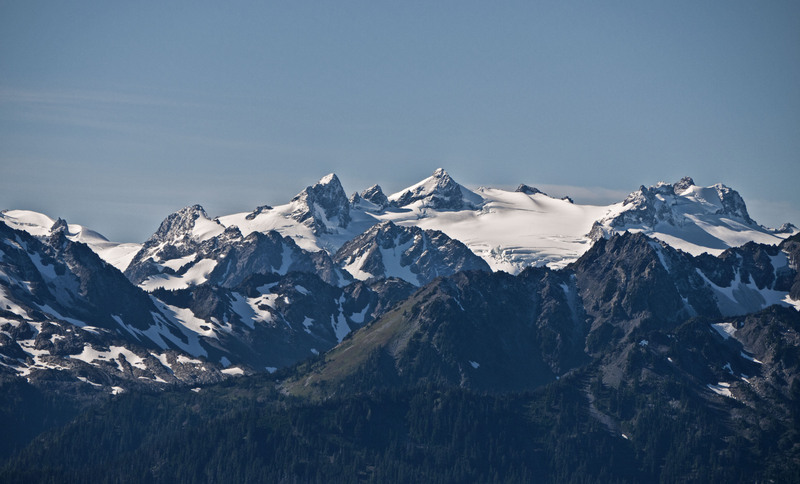 We visited briefly at the visitor centre before heading off to hike the High Alpine trail from which there were views across to Mt Baker in one direction, Mt Olympus and even as far as Vancouver Island. 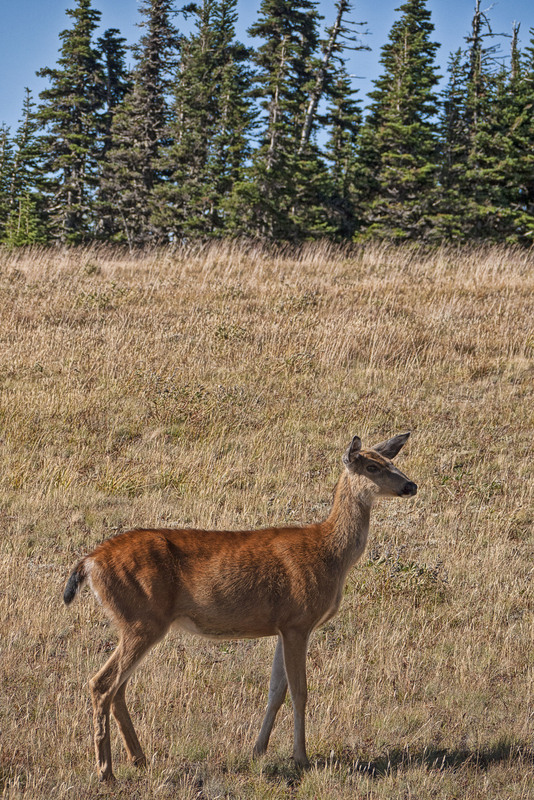 We also saw a number of remarkably unafraid deer on our hike. We spent the day up in the Hurricane ridge area before descending to Hurricane Ridge road and finding a turnout to spend the night. After three nights on the Olympic Peninsula it was time to start heading South (and East) but first we stopped off in Gig Harbour and spent the night at Rob and Nina’s (www.whiteacorn.com) getting the low down on South and Central America as they had got back from a trip all down to Ushuaia and back towards the end of last year. A big thanks to Rob and Nina for some great hospitality and some really good pointers. I’m a web designer in Vancouver, BC and I came across this blog post via Google Images. I really love your panoramic photograph from Hurricane Ridge and I was wondering if I could use it as a background image in my portfolio. That would be ok. Not for commercial use though.